St Albans Museums Service use an iBase digital asset management system for the control and internal distribution of their extensive collection of heritage digital assets, as well as a publicly-accessible terminal. St Albans Museums is composed of a number of sites in and around St Albans, including the Verulamium Museum which is built on the site of one of the largest Roman cities in Britain, and the newly-opened St Albans Museum & Gallery. 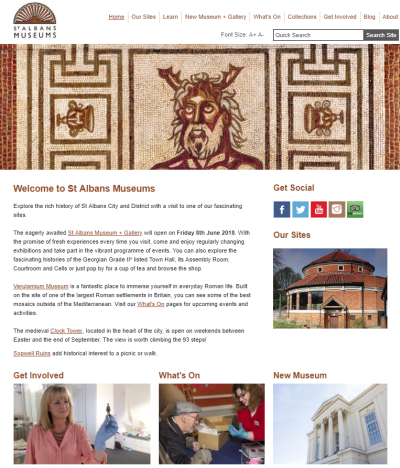 St. Albans Museums have been using iBase software to curate their extensive collections for many years and in 2018 made a customised terminal available to members of the public who are visiting their sites. This enables them to enrich visitors' experiences with additional information relating to the exhibits which they are viewing. Hosted locally within St Albans Museums' IT environment. Used to store digital representations of museum artifacts. Associated descriptive and technical metadata makes items easy to find. Customised public-access terminal for a more immersive experience. Staff can easily control which assets are made available to the public.